A fantastic two days for the club in Athlone. Well done to the 27 athletes who participated. Ailbhe Steger dominated this weekend in the U13 Girls winning three medals with 1st in the High Jump with a height of 1.31, and 3rd in Long Jump & Hurdles. Liam O’Dwyer was a clear winner in the boys U13 Hurdles in a time of 10.41. Chloe Lynch in the U13 Girls came 2nd in the High Jump and James Kelsey U12 surprised everyone with a bronze in his first Leinster High jump event. But Gowran AC proved they can do more than jump with Orla Brennan, Aidan Keating and Rachel Gardiner winning medals in throwing too. Rachel won gold in the U13 girls with a throw of 9.73. Anna came 2nd in the girls U12 Shot and Aidan 3rd in the boys U12. 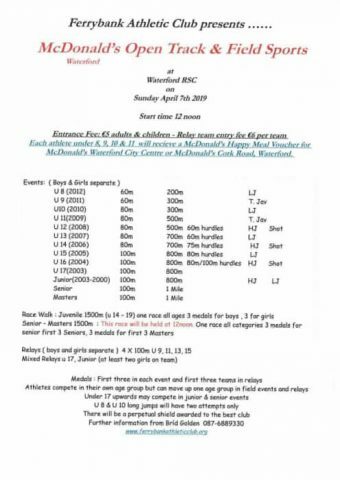 On the track, it was Hannah Kehoe in the girls U16 who won silver in the 1500m, coming 2nd to Thomastown ACs Fiona Dillion setting a new Championship record of 4:47.56.